Take Marketing to a Whole New Level …We Mean Street Level! 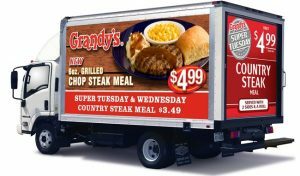 Our LED Mobile Billboards are perfect for your Richardson and Dallas, TX area businesses. Our company delivers high impact ads across the country. LED Mobile Billboards have a “97% AD RECALL RATE”. An astounding 85% of viewers read the entire advertising message while they are driving on high traffic streets, major intersections and high volume shopping areas! Mobile LED Billboards are very effective at targeting potential consumers in close proximity to the actual business location. We are a cost effective alternative to traditional marketing. MonsterADZMedia commands a presence like no other. With no expensive vinyls to produce, you can change your marketing message as often as you would like and display as many different Advertising messages as you want throughout you campaign. The advantage of using our mobile LED billboard trucks is the move-ability factor. NO OTHER medium can guarantee coverage at the exact physical locations your audience lives, works or plays. It’s HYPERLOCAL Marketing at its best!